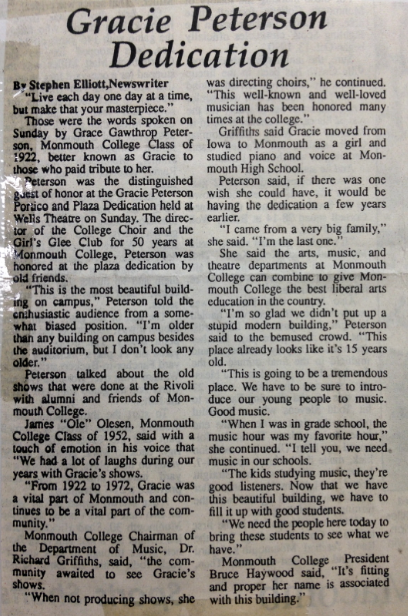 In 1990, Monmouth College dedicated the Wells Theatre portico and plaza to Gracie Peterson for her countless contributions to the music department for fifty years. When asked about her thoughts on the dedication ceremony, the 88 year-old Peterson was quoted: "When they pour the cement for the Gracie Peterson Plaza, I'm going to go down there and put my hand in it like they do in Hollywood. I know darn well I can get down, but I don't think I can get up. I just hope there's a handsome young man to come to this lady's distress to help me get up." In her honor, Monmouth College students and faculty directed and performed a variety show called, "We love Gracie." 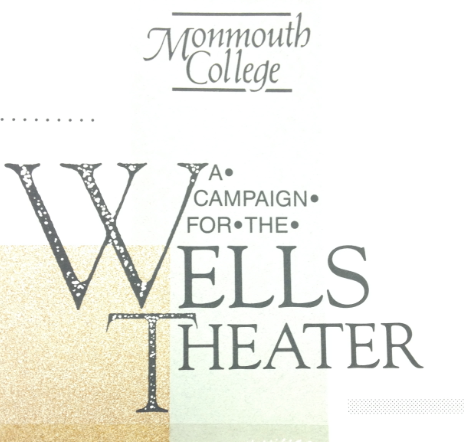 Pictured is the cover of a pamphlet that was distributed in order to promote the plans for the new Wells Theatre in the late eighties. The pamphlet detailed building plans, possible theatre uses, and benefits to students and faculty at the college. One of the campaigns was used to pay for the Gracie Peterson Plaza. 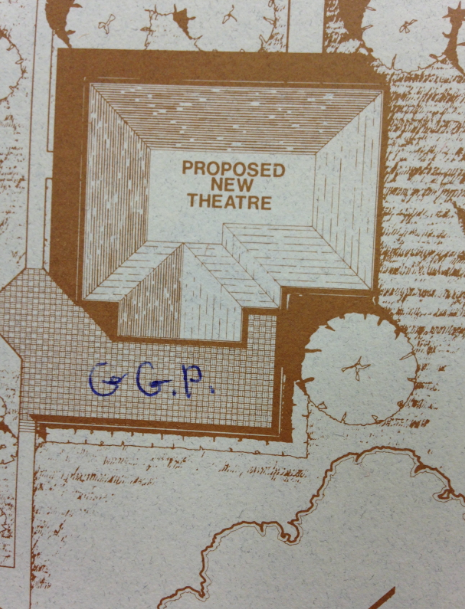 Peterson embellished this "Proposed New Theatre" diagram by designating it "Gracie Gawthrop Plaza." A campaign calling for donations to fund a tribute to Gracie Peterson at the Wells Theatre. 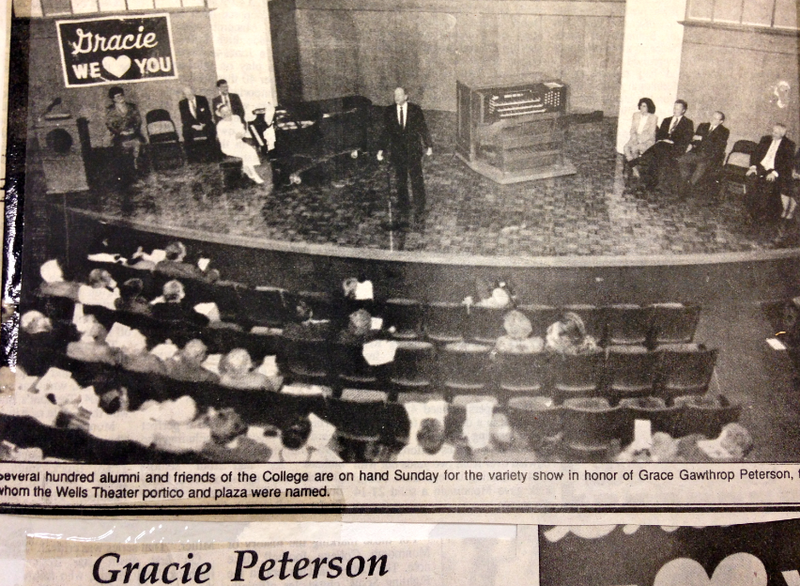 Following the dedication ceremony on October 14, 1990, students and faculty paid tribute to Gracie with a variety show in the college auditorium. 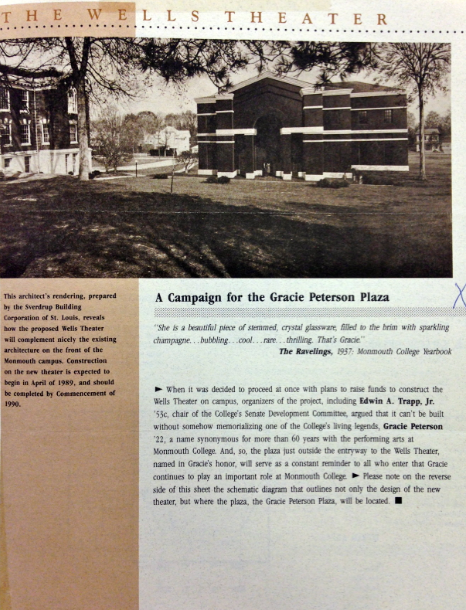 Newspaper article announcing the dedication of Gracie Peterson Plaza at Monmouth College in 1990.